Executives at global investment banks in London expect France and Germany will prevail in a tussle over the clearing of $570 billion of euro derivatives and are making plans to deal with the fallout, according to people at four of the biggest firms. They assume the City of London will eventually be stripped of the ability to clear euro denominated swaps after Britain formally exits the European Union, said the people involved in their firms’ contingency planning, who asked not to be identified because the details are private. While that might take years to happen, employees and operations central to the clearing function will be among the first moved to the continent once Brexit is triggered, one person said. It’s a battle that’s been brewing since before the referendum. U.K. Chancellor of the Exchequer Philip Hammond pledged earlier this month to protect London’s status as the epicenter for European trading in interest-rate swaps, accounting for about 39 percent of the global market. Banks are skeptical he will succeed after French President Francois Hollande and senior German lawmakers said clearing in the common currency belongs in their countries instead. Though the euro business has often been touted as an important bargaining lever in upcoming trade negotiations between Britain and the EU over access to the single market, two of the people said it might not even be up for discussion. European officials could just change the rules after Brexit when the U.K. will no longer have a say, they said. 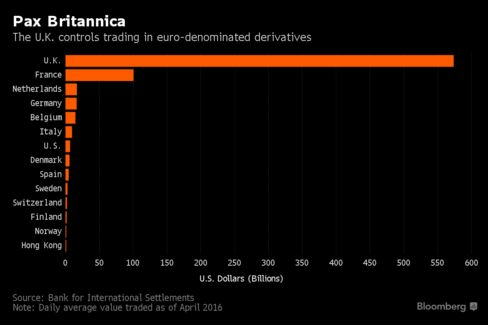 The U.K. handles 75 percent of euro-denominated derivatives transactions, according to the Bank for International Settlements data on over-the-counter trades. The world’s largest clearinghouse for interest rate swaps, LCH, is based in London and is majority-owned by London Stock Exchange Group Plc. Any attempt to move euro clearing from London to the continent would take many years to implement, be hugely disruptive, and drive up costs for companies across the entire region, the people said. Other trading and clearing businesses could follow. It’s also unclear how the ECB could place restrictions on euro clearing without making the currency less transferable, thus undermining its role as a reserve asset and counterweight to the greenback’s dominance, one person said. The person queried whether the ECB would also remove clearing rights from the U.S. and Asia to avoid appearing vindictive. The FIA represents banks such as Goldman Sachs Group Inc., Barclays Plc and Credit Suisse Group AG. Regardless of the complexities, former Bank of England policy maker Charlie Bean has said the loss of the business is a foregone conclusion. “The issue of euro clearing — I wouldn’t say it’s likely that we’ll lose it, I’d say it’s certain,” Bean told U.K. lawmakers earlier this month. Clearinghouses act as firewalls against defaulting derivatives traders by holding collateral and monitoring risks, and their role in global finance has become far more entrenched since the 2008 financial crisis. About 700 people are directly employed by London’s clearing firms, and those staffers have many counterparts at major banks that are members. Estimates put the number of clearing jobs in London’s financial district at more than 1,000. Even before the Brexit vote, the ECB had its eye on requiring euro trades to be cleared in the euro area. The central bank’s campaign went all the way to the EU’s top court. It argued that in times of crisis, it should have oversight over clearing in its own currency. The issue seemed settled after EU judges said in 2015 the central bank couldn’t dictate where euro-denominated trades are cleared, but the decision acknowledged that the laws could be amended. A U.K. lawmaker said after the ruling that the win wouldn’t have been possible were the country outside the EU. Before the vote, Deutsche Bank Chief Executive Officer John Cryan said he expected a shift in euro business to the nations that share the currency away from London. Professionals in the industry are quick to note that clearing and trading is a global business. They say it shouldn’t be constrained to a particular region and that it developed naturally in the U.K., likely because its regulations, taxes and talent pool helped it thrive. London Stock Exchange CEO Xavier Rolet has also said that the City’s financial plumbing benefits everyone, not just the U.K. In a speech this month, he said LSE’s infrastructure, which includes clearing, freed up $25 billion in capital that financial companies could invest in the broader global economy.